Even though this is the sixth movie in the series, Mission: Impossible - Fallout has many firsts. This is the first MI movie to be released in 3-D (RealD 3D). Christopher McQuarrie has become the first MI director to call the shots on more than one film in the franchise. And while on the subject of firsts, Rebecca Ferguson, who plays MI6 agent Ilsa Faust, is the first female to appear twice in a leading role in a MI film (also noteworthy is that she was pregnant while filming her scenes). At age 56, Tom Cruise is in amazing physical shape and still looks credible as an action star (unlike Roger Moore in his later James Bond movies). Cruise’s devotion to his craft is remarkable and his stamina is undeniable, especially since he continues to do most of his own stunts. Cruise trained for a year in order to pull off the HALO (High Altitude, Low Opening) parachute jump in the movie. Since the scene takes place near sunset, Cruise and crew could only attempt one jump per day. With the assistance of a C-17 military aircraft and a ground crew to create a vertical wind tunnel, Cruise made over one hundred jumps at 25,000 feet just to deliver three shots for McQuarrie to use in the film. Now that’s dedication! Not all of Cruise’s stunts were successful, though. In a scene where he jumps from one building to another, Cruise fractured his ankle, which delayed shooting for nearly two months. Weighing in at 2 hours and 27 minutes, MI6 has a longer running time than any previous film in the series. Unfortunately, it’s about 27 minutes too long. That comment is no disparagement of the movie’s action sequences, which are innovative, wildly entertaining and, along with Cruise and Henry Cavill, the main draw of the film. If MI6 were to be judged solely on its high-octane action scenes, it would be a 4 star film. However, in a summer blockbuster jam-packed with mind-blowing stunts, it’s easy to mistake spectacle for quality. Despite having some of the finest pulse-pounding stunts in the entire series, this is a lesser MI film, thanks to McQuarrie’s flaccid screenplay. The passé premise (the 80s spy movies called and want their plutonium back), trite dialog (“Family…what can you do?”) and languid storytelling (especially in the early stages of the film) are all narrative ailments the film can’t quite overcome. That’s not to say that the film doesn’t have a plot…it does; a very straightforward, predictable and contrived one. People from Hunt’s past pop up at regular intervals with little explanation or preamble. Erica Sloan’s (Angela Bassett) backhanded comment about IMF agents treating every day like Halloween is amusing and incisive. Ironically, the movie fails to take its own hint since the mask gag is overused here. The down-to-the-last-second bomb disarming is a hackneyed story element that, thankfully, is delivered with a little self-reflexive humor here. McQuarrie trots out the tired “mole inside the operation” plot device in an effort to muddle the motivations of Hunt (Cruise) and Walker (Cavill), but the shocking reveal is obvious from the start. And why did Hunt and Walker have to parachute from a high altitude (a similar sequence appears in 2009s Star Trek), through a lightning storm no less, just to land on the roof of a Parisian building they could’ve gained access to with a proper disguise? Maybe it’s because we get a show-stopping stunt sequence out of the deal or because the rapid plummet ties in with the movie’s title—the theme of personal and physical descent permeates the story. All things considered, MI6 is a decent actioner with solid performances, stellar directing and mind-blowing cinematography. The location work, particularly the scenes shot in London, Paris and the United Arab Emirates, is truly exceptional and effectively simulates the continent-hopping narrative of a James Bond film. The one thing the MI films have consistently done right, and probably one of the major reasons why people keep turning out to see them, is that each new film ups the ante with its jaw-dropping, gravity-defying stunts and action scenes (like a modern-day Houdini, Cruise is a magician who keeps topping his previous death-defying feats). The last half hour of this film contains a chain of top-notch, heart-stopping action beats that will literally leave you gasping for air. 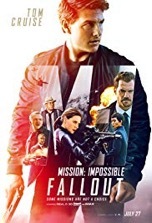 If you can get past the “same ole” plot elements, MI6 is a riveting, thrilling popcorn flick that ends with a cliff-hanger and seems destined to be followed by another sequel.